SPECIAL OFFER: FREE 2-DAY SHIPPING! ALSO: for the next few days, if you check out using PAYPAL we will give you an extra bottle of Nit Glue Dissolver FREE! LiceKiller is Made in California by a Retired Organic Farming Family. The Small "Everything You Need" Kit. LiceKiller is the BEST Head Lice Treatment. LiceKiller is recommended #1 by MothersAgainstHeadLice.org! C﻿﻿﻿LIC﻿﻿﻿K HERE to see MothersAgainstHeadLice.org's Review of LiceKiller. 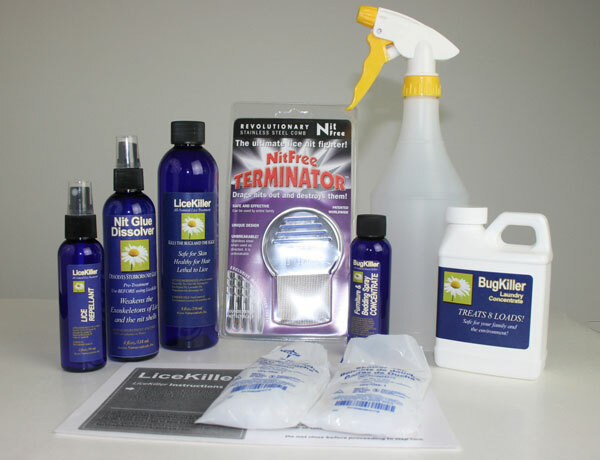 If you can't get rid of head lice, here is why you need to get an "Everything You Need Kit" from LiceKiller.com. 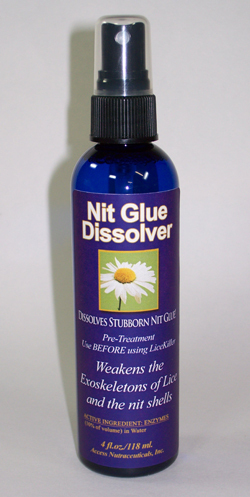 Nit Glue Dissolver - Makes it way easier for you to get the nits out. No other company has a product like this. Essential Oil Lice Killing Formula - Kills Head Lice much better than the poison-based treatments. Totally safe for your humans (even babies) and your pets. Created by a retired Organic Farmer. All-natural ingredients. No waiting. Use anytime you see a re-infestation appear. 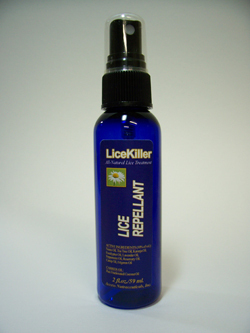 Lice Repellent - Another LiceKiller Exclusive Product! Helps to keep the lice from coming back. 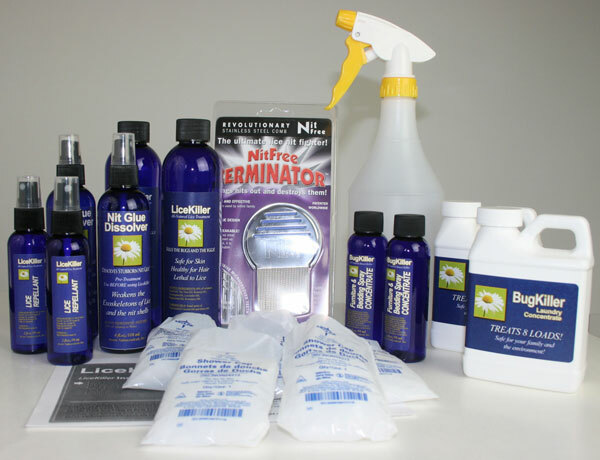 Furniture Spray - Our exclusive enzyme formula kills stray lice and nits that might be on your furniture, toys, pillows, car seats, etc. 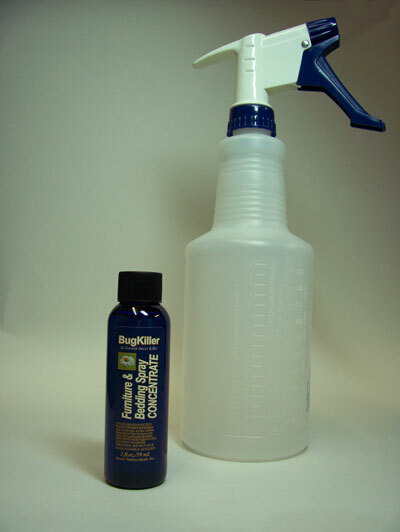 This product is ESSENTIAL to help prevent RE-INFESTATIONS. Laundry Concentrate - If you have lice in your hair, you have lice in your clothing and bedding. 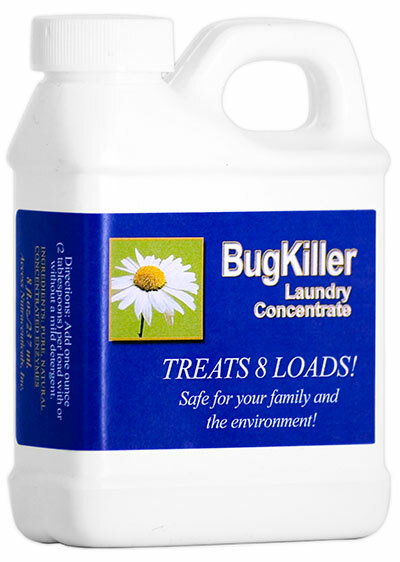 Our enzyme formula works fantastic to help kill the bugs and their eggs in your laundry. 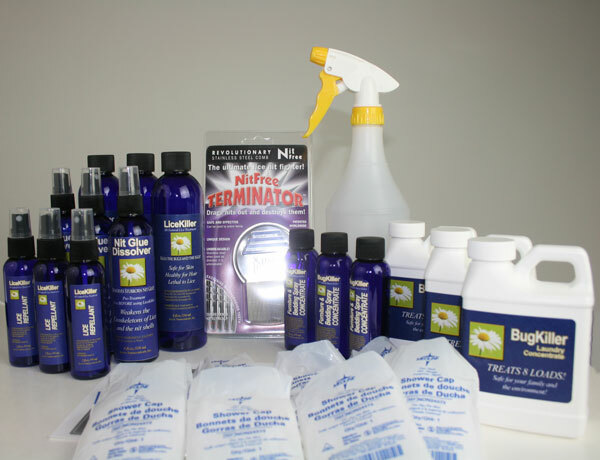 We have put together some money-saving kits that give you "Everything You Need" to get rid of head lice. It takes the guess-work out of deciding what to order. And the kits save you money! All you have to do is get the right kit for how many heads and how large of an environment you are treating. Treats 1-2 Heads plus an Apartment or Small House (no cars). Treats 2-4 Heads plus a Medium House and one car. Treats 3-6 Heads plus a Large House and Two Cars. Not only is LiceKiller the #1 Recommendation of MothersAgainstHeadLice.org, it is also the treatment of choice by many Professional Head Lice Removal Companies. We also have available a fantastic tool to help you get ALL the lice and nits out of your hair. It's the Magnavisor. It is super helpful because sometimes the baby lice are too small to see. We sell them for $19.95 but for a LIMITED TIME, if you order an "Everything You Need" Kit within the next 2 hours, you can get one for free! I have been through head lice on more than one occasion… several times in Florida while we lived there when my daughter’s best friend’s mother only treated her daughter’s head and not the rest of the house, and once here in Michigan which is when I turned to your product!!! OH MY GOSH what a Godsend it was. Thank you so much! The head lice nightmare we had was terrible. Just when we thought they were gone, they came back. We started off using the chemicals our doctor prescribed and all got sick from chemical exposure. Then I found your product. It worked better then expected and was surprisingly easy to use. I have recommended it to my family and friends. O MY GOD, THE PRODUCT WAS GREAT, I HAD SPENT TIME AND MONEY TO GET RID OF THE LICE ON THE PRODUCTS THAT I WAS BUYING AT THE DRUG STORES, BUT THIS REALLY CHANGED OUR LIFE. IT WAS WORTH EVERY DOLLAR I SPENT ON IT. I LOVE IT. I ONLY HAD TO USE TWICE AND THE LICE WERE GONE. THAT WAS MY FIRST EXPERIENCE EVER AND I THINK IS THE LAST ONE. The truth of the matter is that your product is fantastic, it worked in one try. My poor daughter works in an after school program at a local elementary school and she loves working and teaching the kids as they really love her too. Well, they hug her all the time. Therefore, they also shared not only their affection but their lice too. My daughter has extremely, mega thick beautiful spiral curls (natural) all the way down her back. We tried several products, several times. I was so upset that we had to apply toxic chemicals on her head and hair. It was a godsend to have found your natural product on the web. I am one very satisfied customer and certainly understand the horror parents go through for their children and on occasion their adult children. I used to be a hairstylist and thought I knew ALL about head lice. I realized that I didn’t know much at all until I had to deal with it in my own family. When my youngest daughter first got it, we called our doctor’s office and were told to use Nix, which we promptly ran to the drug store to purchase. My husband proceeded to do some research on the internet to see if there was anything else we could do, only to find out that the over the counter products contain poisonous pesticides, which we had already put on our child’s head. We decided to go the distance with the Nix, for the next week, since we’d already used the product and couldn’t undo it. We spent one week torturing our daughter (not intentionally) having to comb through snarly hair (you can’t use conditioner with Nix), and very meticulously picking out every single nit we could find. It was about a 90 minute routine every single day for a week. We would have bet money that you could not have found more than 1-2 nits by the end of that week, we were that thorough. Exactly one week after using Nix, when those remaining eggs hatched, she had a head FULL of live lice—we actually found about 40 bugs. UUUGGGHHHHH!!!!!! We decided to take a chance on your product, and paid to have it shipped overnight to us. It worked exactly like you said. It killed the eggs and the live lice. After my oldest daughter had been scratching her scalp raw for over a month, we decided to do the LiceKiller treatment on her as well, only to discover that she also had a head full of live lice. I proceeded to treat my younger daughter AND myself, and discovered that I had it as well, and my younger daughter had probably just gotten it again because she didn’t have many lice. I felt really stupid for not just treating all of us the first time around. NOW WE KNOW!!!!! I treated all 3 of us a second time, about a week later, just to be sure that they were all gone because my kids were starting school within DAYS after this. We checked all of our heads religiously the first month of school and did not find any more lice, and haven’t had it since. If you have any questions about LiceKiller, please call or text us at: (559) 667-7208. We do not do refunds. Defective products may be returned and exchanged for a replacement. But we guarantee that if you follow the directions, LiceKiller products will kill all the lice you are dealing with.